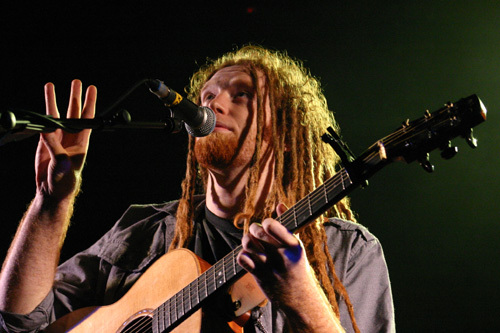 Newton Faulkner has announced a 12-date tour of the UK this October in support of new album 'Rebuilt By Humans', which is due out in September this year. The acoustic-guitar virtuoso second album is due for release on Monday 21st September 2009. The album is preceded by the first single from it, 'If This Is It' released the week before. The title of Faulkner's second album, the follow up to 2007's 'Hand Built By Robots' was decided on following an accident where he broke his wrist in France and dislocated his entire right hand. Faulkner nearly lost the movement in his hand and after a series of painful procedures by French medics and a career saving operation at home in the UK, Newton was successfully rebuilt by humans and within days was back doing what he loves most, playing his guitar as taught by the legendary Eric Roche. Newton says "I wanted to avoid the classic second album thing of complaining about how great things have gone and all the hard work. I had brilliant fun making this album, and hopefully it sounds that way. That's another reason why If This Is It is great for the first single: hopefully it comes across as quite grateful. Because I am grateful." Tickets go on sale at 9:00am, this Friday 17th July and eGigs will have links to buy them then. Tickets are priced £16, except Cornwall and York £16.50, London and Manchester, £17.50.